Just a few miles from the center of Silverton, where a series of mines – which once made the town's fortune – now lies abandoned by industry, the earth cannot heal. At Red and Bonita Mine, the mountain opens like a wound, oozing a sticky, white, webbed lattice over red ground. There, especially after heavy rains, toxic amounts of metal gush out from within the mountain and bleed into Cement Creek. Peter Butler, co-coordinator of the Animas River Stakeholders Group and chairman of the Colorado Water Quality Control Commission, said Cement Creek is one of the largest untreated mine drainages in the state of Colorado. U.S. Geological Survey hydrologist Rob Runkel said Cement Creek is uniquely damaged in comparison to other sites he has worked on in New Mexico and Montana. Cement Creek flows into the Animas River, Durango's vital aquatic artery. 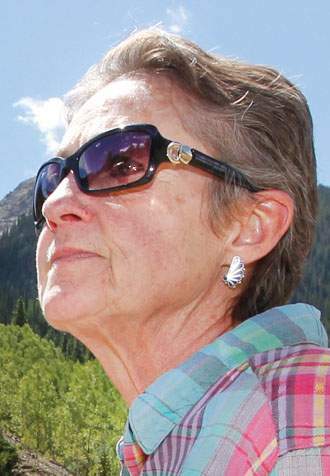 La Plata County Commissioner Gwen Lachelt said the looming environmental implications of not treating the creek's high toxic-metal concentrations – the slow strangulation of the Upper Animas River's ecosystem – are serious for every community downriver of Silverton, as well as the region. After all, the Animas River is a key part of the Southwest's water supply, flowing from Durango to Farmington, where it converges with the San Juan River, which in turn joins the Colorado River at Lake Powell. While Cement Creek has posed an environmental problem for decades, scientific consensus is that the metal pollution recently has grown worse. For much of the 1990s, scientists took heart that the metals flowing into the Animas from Cement Creek were diluted by the time the water reached Bakers Bridge, a swimming hole for daredevils about 15 miles upriver of Durango. But between 2005 and 2010, 3 out of 4 of the fish species that lived in the Upper Animas River beneath Silverton died. According to studies by the USGS, both the volume of insects and the number of bug species have plummeted. And starting in 2006, the level of pollution has overwhelmed even the old bellwether at Bakers Bridge: USGS scientists now find the water that flows under Bakers Bridge carries concentrations of zinc that are toxic to animal life. 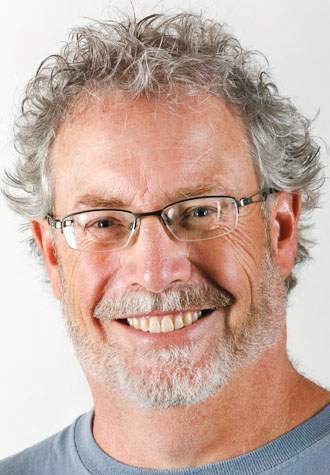 Bill Simon, co-coordinator of the Animas River Stakeholders Group, said cleaning up the environmental damage wrought by mining remains the unfinished business of previous centuries. “Getting anyone to pay is notoriously difficult,” he said. He noted that without robust regulation, it was common practice from the 1870s on for mining companies to take what they could and then go broke, abscond or incestuously merge with other mining entities, leaving the future to foot the bill. Mining played a critical role in forging the West. But its legacy is far from resolved, leaving more than 500,000 abandoned rock mines throughout the country. That figure includes more than 23,000 mines in Colorado, and nationally, the cleanup costs could range up to $72 billion, according to Trout Unlimited, a national fisheries conservation group. Perhaps nowhere in Colorado is mining's legacy as both a creative and destructive force more acute than in Silverton, a tiny town with a population of about 690 nestled in the San Juan Mountains. Mining outfits extracted nearly $530 million worth of gold, silver, copper, lead and zinc from the San Juan Mountains – a number not adjusted for inflation – from 1871 until 1991, when Sunnyside Gold Corp. shut down American Tunnel in Silverton, according to a 2007 study by the USGS. Though mining left Silverton more than 20 years ago, Silverton still makes its living off its mining history, offering tourists a chance to relive the harsh mortal glory of wresting metals from the earth. 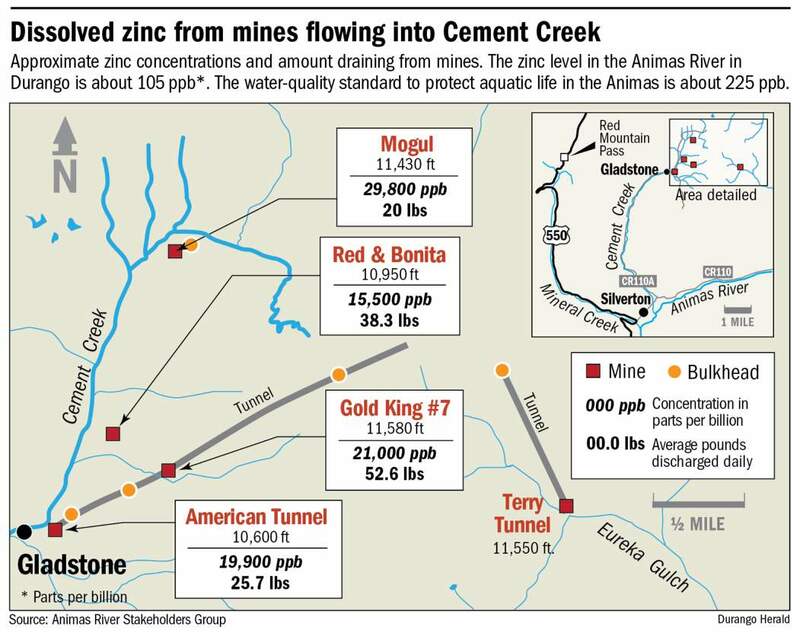 Meanwhile, Silverton's mines have contaminated the Cement Creek tributary with problematic concentrations of zinc, copper, cadmium, iron, lead, manganese and aluminum for more than a decade. Cleanup efforts have been entangled in ongoing legal maneuvering between Sunnyside Gold Corp. and various government bodies. The fight involves the state of Colorado, the U.S. Bureau of Land Management and the U.S. Environmental Protection Agency. 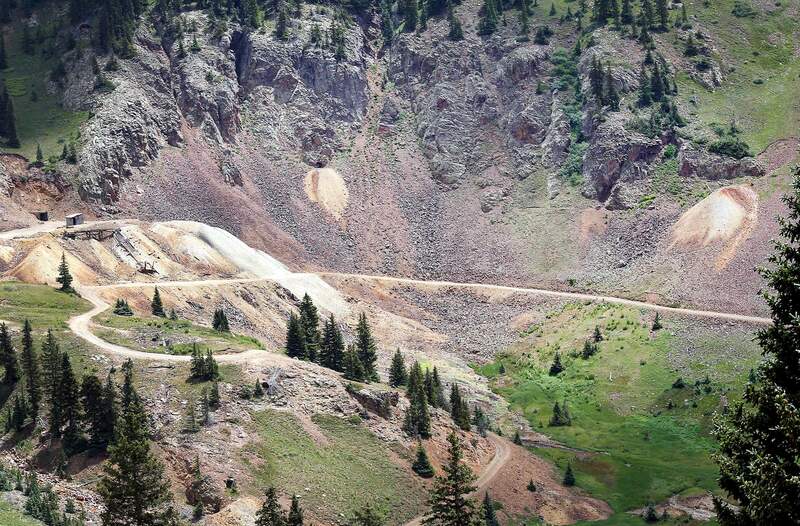 Since Sunnyside closed its mining operation in Silverton, the EPA often has attempted to place parts of the Silverton area under the powerful environmental law CERCLA – the Comprehensive Environmental Response, Compensation and Liability Act of 1980. It is more commonly referred to as Superfund. Silverton resisted, arguing that the designation would hurt tourism and sully prospects for new mining operations. In the meantime, the EPA, along with the BLM, has pursued a two-part strategy, seeking a settlement with Sunnyside, which denies all liability for Cement Creek cleanup, while working with Sunnyside to improve water quality in a collaborative process through the Animas River Stakeholders Group. The group is an unlikely mix of longtime Silvertonians, scientists, environmentalists and mining interests. For a while, it appeared that the stakeholders' collaborative effort to clean up Cement Creek was working: After Sunnyside Gold Corp. stoppered American Tunnel with the first of three massive concrete bulkheads in 1996, declining water flow from the site meant less metal pollution in Cement Creek. But Butler said that in 2004, the bulkheads stopped functioning like a cork in a wine bottle. Instead, they started working like a plug in a bathtub: Water, prevented from exiting the mountain through American Tunnel, rose up within the mountain until it reached other drainage points, namely, the Red and Bonita, Gold King and Mogul mines. 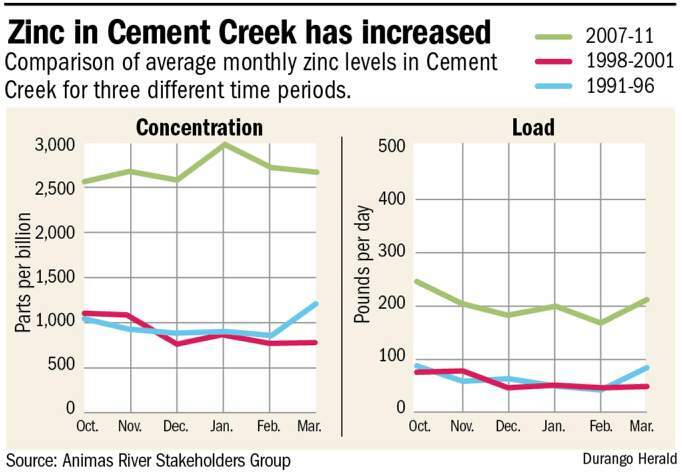 Since then, Butler said, data shows that most metal concentrations in Cement Creek have “easily doubled” their pre-bulkhead amounts. He said as a result, the recent environmental damage done to the Animas has far outpaced gains made in other stakeholders group cleanup efforts, like the remediation of Mineral Creek, another Animas River tributary. 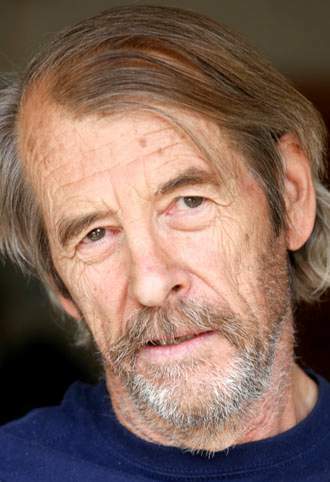 McKay said Silverton still hopes to find a solution through the Animas River Stakeholders Group. 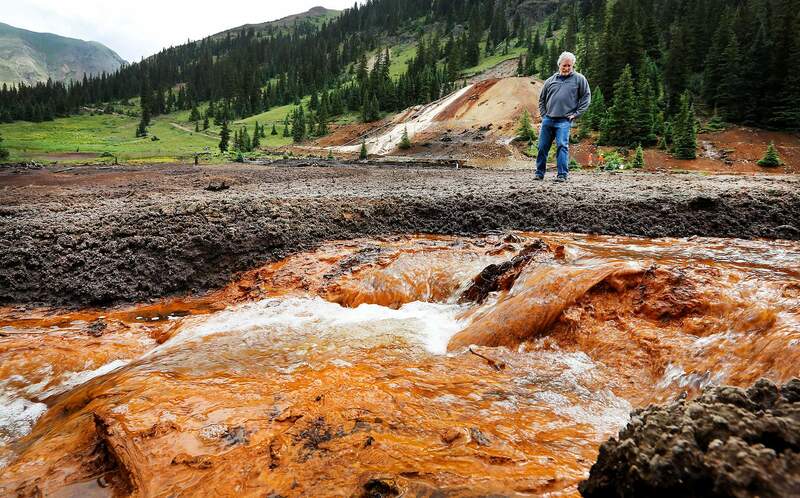 Though federal budget cuts have seriously diminished the EPA and gutted its Superfund monies, the EPA says the mine drainage in Silverton has gotten so bad it may yet pursue a Superfund listing. And without federal intervention, even stalwarts of the Animas River Stakeholders Group say it's not clear there will ever be enough money to clean up Cement Creek. 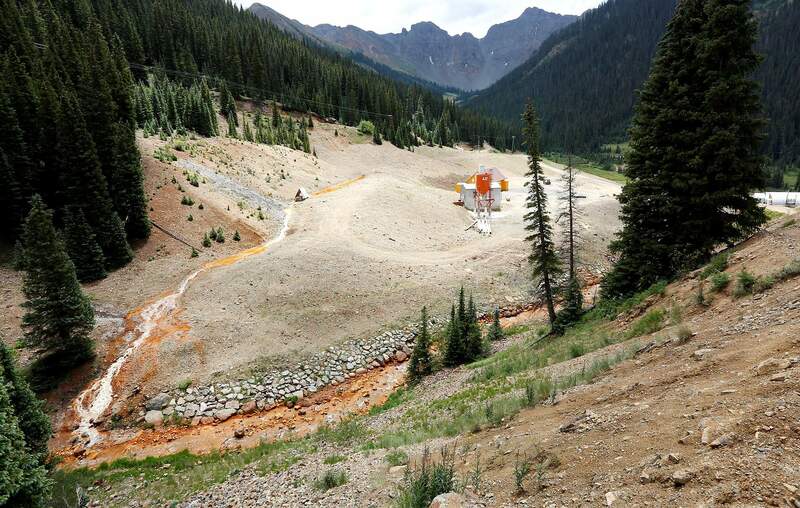 Walking in the so-called “kill zone” below the Red and Bonita Mine, Peter Butler, co-coordinator of the Animas River Stakeholders Group, sees water carrying high levels of metals that will flow into Cement Creek north of Silverton. Scientists say plants and animals cannot live in the “kill zone” because the water contains toxic metal concentrations. TODAY: How serious the problem is and why it's been so difficult to fix. Also, why Silverton has resisted federal money and the Superfund label that would come with it. Tuesday: Silverton's mining history lures tourists. Faced with a difficult environmental challenge, residents talk about bringing the industry back after a 22-year absence. Water flowing down the mountainside out of the Red and Bonita Mine contains high levels of metals that will make its way into Cement Creek. For more than a decade, Cement Creek has in turn been contaminated by manganese, zinc, copper, lead, cadmium, aluminum and iron. 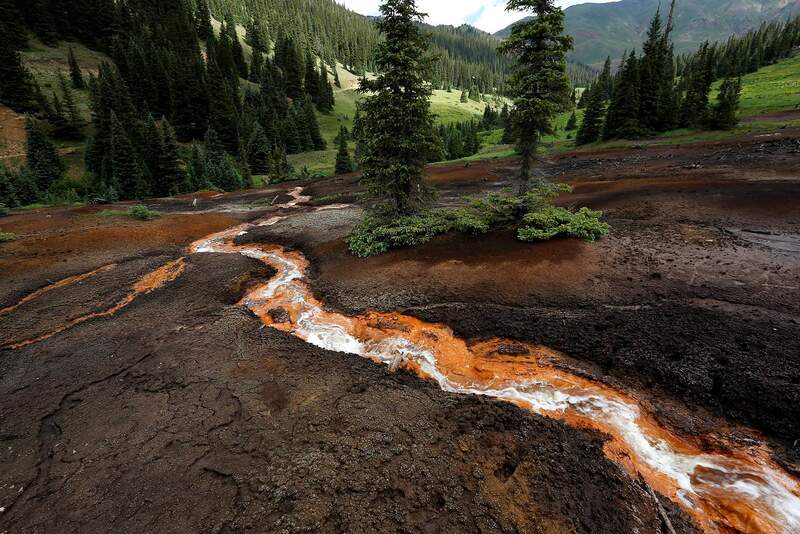 Water flowing from the Red and Bonita Mine north of Silverton leaves a wake of lifelessness in its path. The color of rocks indicates the heavy amount of minerals coming from the Red and Bonita Mine. 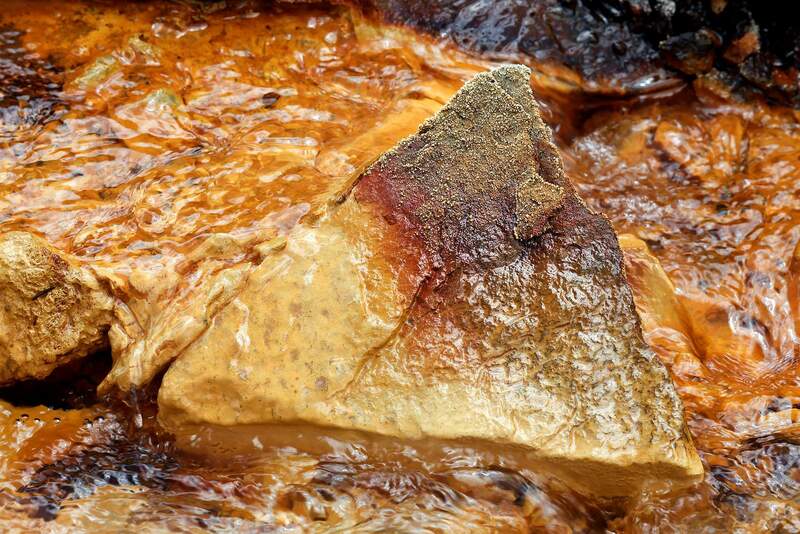 Some of the mineralization is natural, but scientists believe much is caused by drainage from abandoned mines. 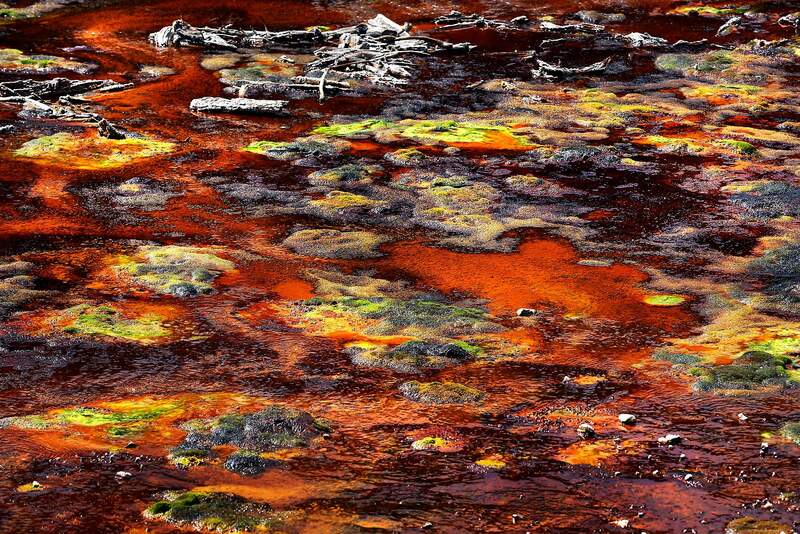 Metal-polluted water creates a spectacular palette of colors. 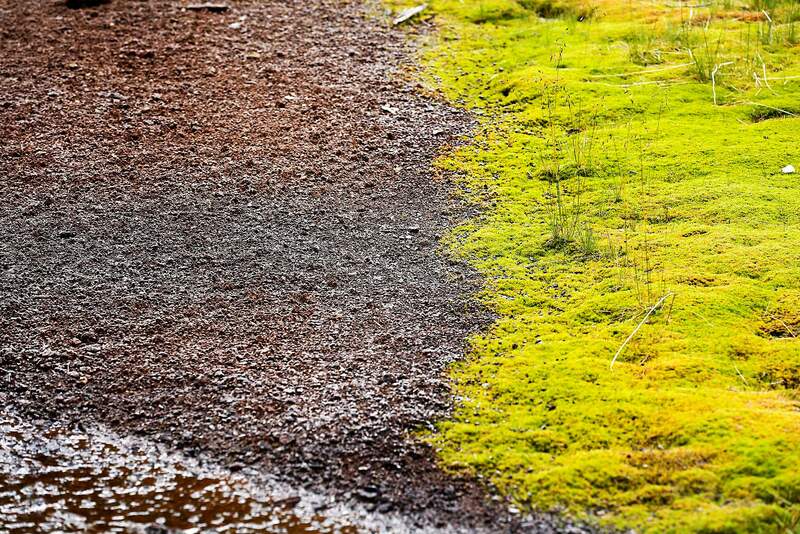 A panoramic image of two photos shows natural spring water meeting toxic metals along Cement Creek’s bank. Red and Bonita is one of the mines draining toxic concentrations of metal into Cement Creek, which flows into the Animas River. 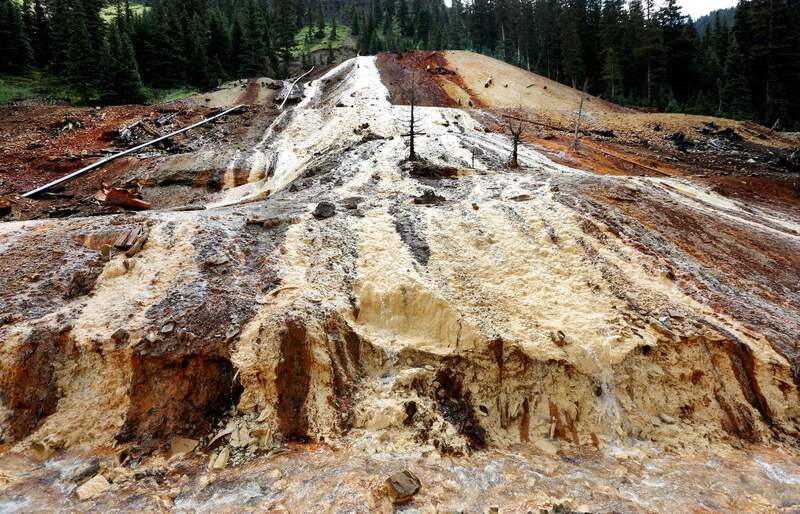 Toxic water flows out of the American Tunnel north of Silverton. The water dumping into Cement Creek and then into the Animas River in Silverton. The structure at the site was once used to treat the water from the tunnel with lime. Water flowing out of portals next to Mogul Mine, and flowing of out the mine, not seen, will quickly reach Cement Creek, adding to the heavy concentration of minerals. The most northern big mine in the Cement Creek drainage area started leaking out of its portals in 2006, but the main mine has always been draining.